Devoted to the classics, while incorporating exclusive innovations and pioneering creativity - discover the brand that's 'Born To Dare'. In 1926 the founder of Rolex, Hans Wilsdorf, registered the trademark for TUDOR. Wilsdorf had the idea that TUDOR would be an obtainable, luxury timepiece brand, combining unique elements from its sister brand Rolex. He could never have imagined that over 100 years later, TUDOR would become the iconic brand it is today. With its rich history intertwined with revolutionary mechanics and award-winning design, it’s no surprise that TUDOR constantly celebrate their heritage within every timepiece they release. Forging their own path within the watch industry, the brand have worked hard to carve out their own identity whilst embracing their connection to Rolex. TUDOR watches have transformed over the years, but they have never forgotten their heritage. The brand are constantly looking to evolve their designs, but often incorporate details from their early models which maintain their definitive TUDOR aesthetic. 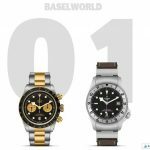 The arrival of the 1926 collection last year, named after the year the brand was created, showcased an assortment of watches inspired by the brand's early history with a range of mechanical watches that are timeless and elegant in their design. Whilst the Black Bay collection highlights over sixty years of diving history distilled into one truly iconic collection. The Black Bay range draws its most characteristic features from past models in the brand’s history, most notable including their distinctive angular 'snowflake' hands. Tudor's ‘Born to Dare’ campaign celebrates the aspirational, high-octane brand that TUDOR identify as today. With brand ambassadors such as Lady Gaga and David Beckham, embodying the essence of TUDOR, and representing the brand’s constant drive for unparalleled excellence and continued success.